It's a formula Zdarsky has relied on with the first two issues as well. Jughead gets in a jam, a crazy daydream (Game of Thrones-style in issue one, a space epic in the second) informs his plan of action, and Jughead cleverly solves his dilemma. In issue three, most of that remains true except with an assist from Jughead's dad. Despite the familiar pattern, Zdarsky lays out an entertaining tale that really thrives once the dream sequence begins. 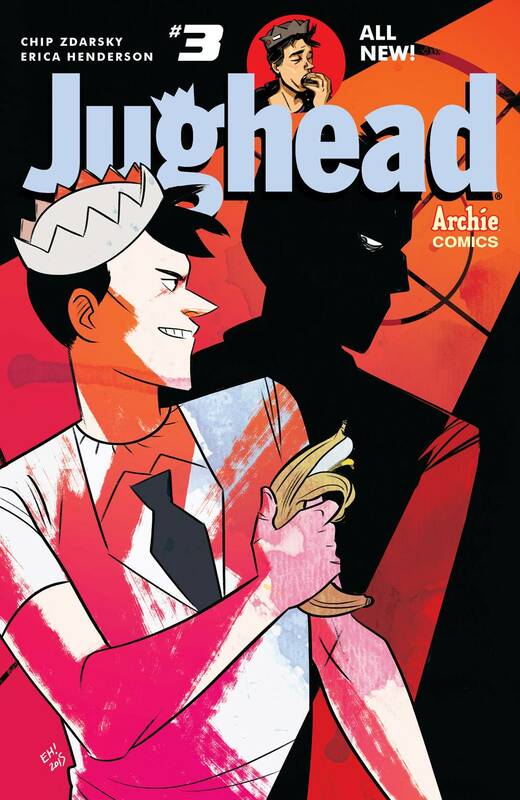 Another wild and over-the-top fever dream that could only be conjured up in Jughead's mind. A fun riff on spy tropes. As usual, Henderson's art is lively and expressive. She offers bold reactions and frenetic action scenes that you'd swear the Monkees music is playing as the soundtrack. She makes characters like Betty, Archie, Chuck, Veronica, and Pop all her own but keeping their classic personas intact. Even as the series falls into a recurring pattern of storytelling, 'Jughead' #3 still entertains with humor, crazy interludes, and wonderful colorful layouts.